Casagemas takes place in the mind of Pablo Picasso as he relives memories that lead to the suicide of his best friend, Carles Casagemas. We meet the 19-year-old Picasso during his “Blue Period” when he painted figures of homelessness, illness, blindness, death, loneliness, and hunger in a strict palette of blues. I was struck that, during this time, Picasso's self-portraits changed from a handsome and roguish boy, to a sullen large-eyed man. Sharif's play fills in the blanks between the portraits—how did the boy turn into the man? It is a unique fusion of theater and opera—pulling from both art-forms, but not strictly adhering to either. I kept figures that will become the subjects of Picasso's paintings continuously onstage, haunting the space until they step into the light to sing poetic ballads in spanish about the true nature of the world Picasso and Casagemas are discovering. 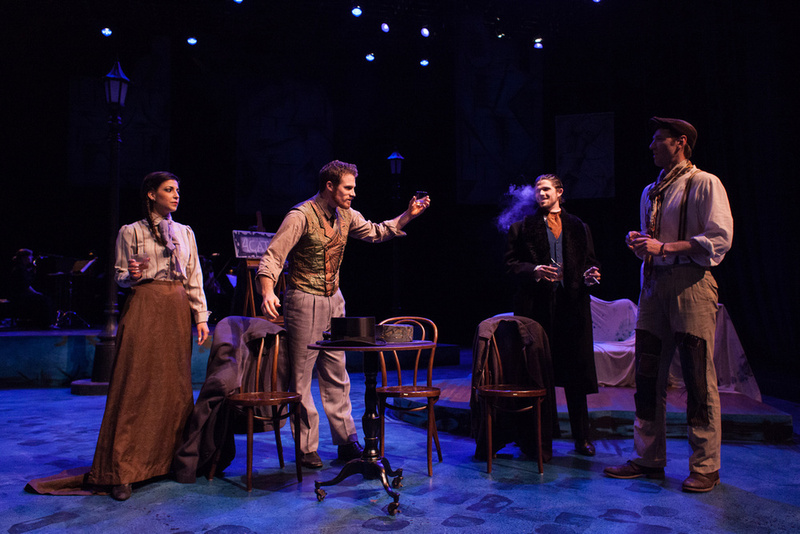 By having four performers play all the supporting characters, I created a fluid world that shifted around the two friends as they traveled through cafes in Spain, streets in Paris, artist studios and opium bathhouses. Casagemas (Michael Hammond) toasts Picasso (Walker Hare) after Malouf (Russell Ewing) offers to display his work in Paris. 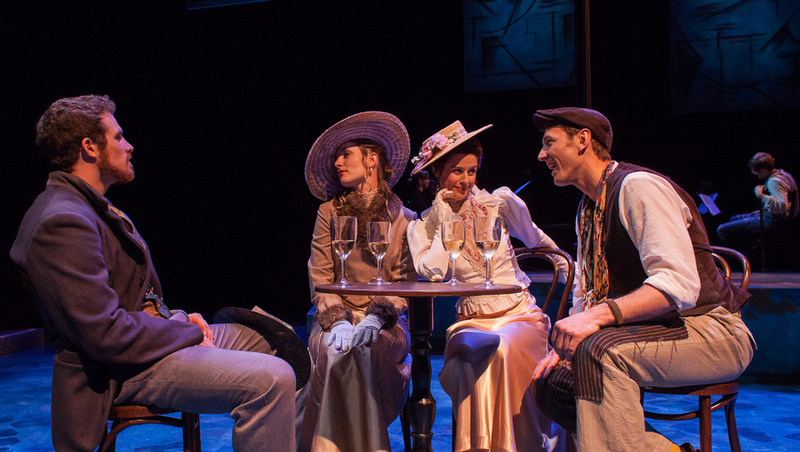 In Paris, Casagemas (Michael Hammond) and Picasso (Walker Hare) meet Germaine (Hannah Tamminen) and Odette (Vi Flaten). A begger (Brian Bose) sings about loss as Picasso's painting is displayed at an art opening. Picasso (Walker Hare) and Casagemas (Michael Hammond) drunkenly brawl on Germaine's (Hannah Tamminen) doorstep. Casagemas (Michael Hammond) complains to Germaine (Hannah Tamminen) about Picasso's rising fame. A fortune teller (Lizzie Shipton) reflects a frightening future for Germaine (Hannah Tamminen). Casagemas (Michael Hammond) is rejected by the art dealer Malouf (Russell Ewing). Back in Spain, Jasmine (Haya Yasmeen Nasser) splashes water in Picasso's (Walker Hare) face. 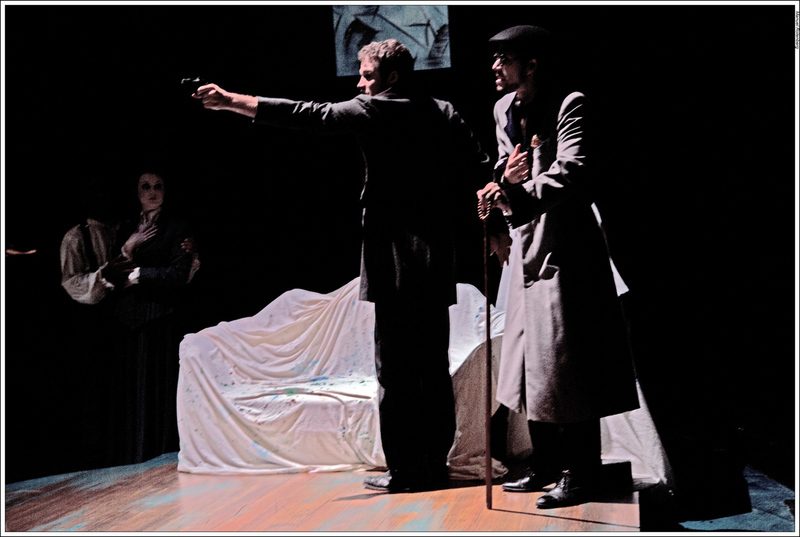 Picasso (Walker Hare) takes Casagemas (Michael Hammond) to an opium den. Casagemas (Michael Hammond) shoots Germaine and then himself.